These sprouts generate from the green bean or the mung beans. It’s available everywhere across the country. They come in packages in Supermarkets. In my local market they have bucketful and you can ask for half a kilo or 5 bahts. We use bean sprouts in noodle dishes such as Pad Thai or Noodle Soup or fry them with Tofu or use them as the filling for spring rolls. Healthy Bio-diet is popular now in Thailand and small groups of people are trying to grow their own vegetables. 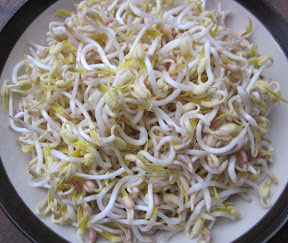 Bean Sprout is one of the few things we can do easily at home. We use Mung Bean, Peanuts and Alfalfas to generate the sprout and make fresh Salad. The ones generate from Soy bean, because of its big seed, we call it Tuea-gnog-hua-toor (ถั่วงอกหัวโต) or big head bean sprouts, which we cook them in clear soup with mince pork for children. In the picture is my home grown bean sprout. The home grown bean sprout stays fresh longer than the bought ones and all I need to do is just remove the stem and put them in closed box and keep in the fridge.